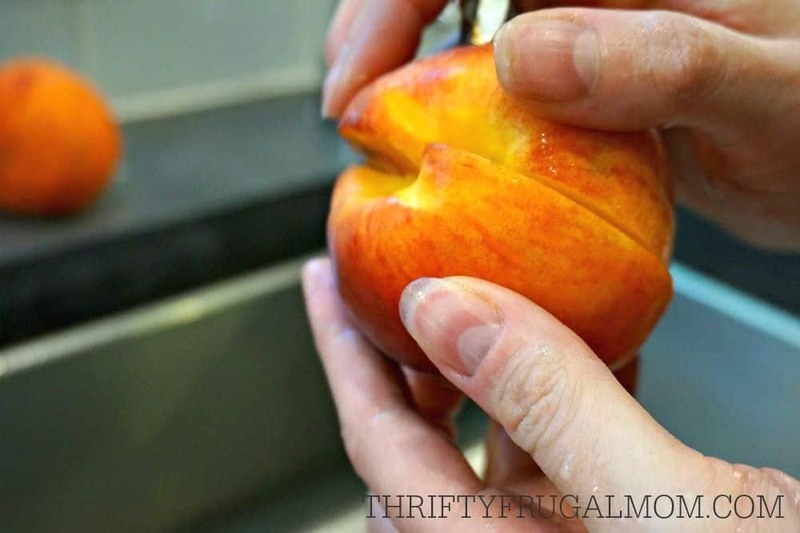 This easy step-by-step photo tutorial will teach you how to can peaches in no time! 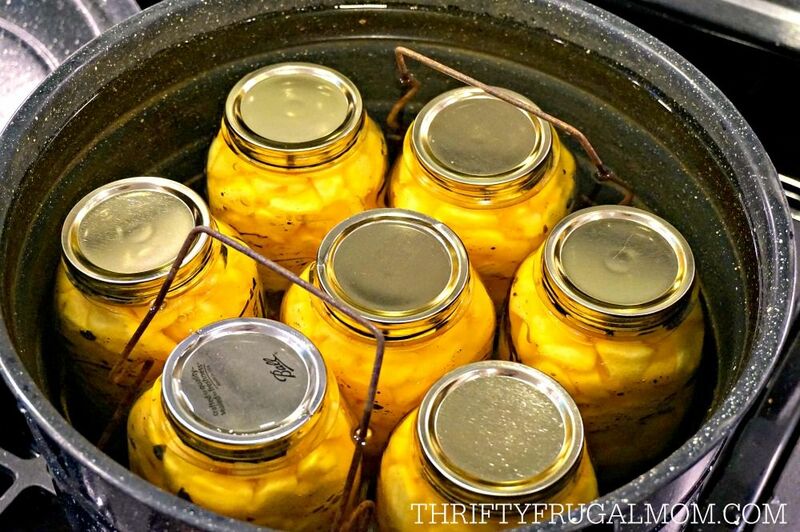 Who knew canning peaches could be so easy? 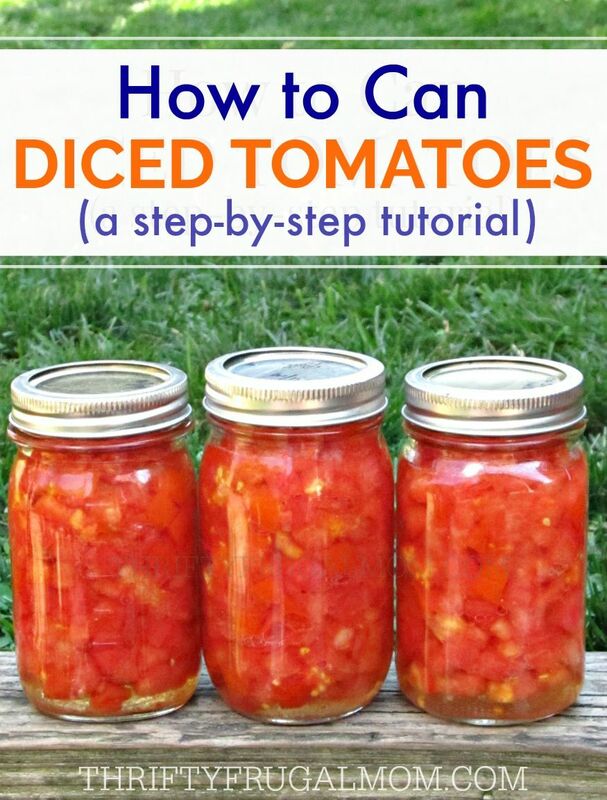 Every summer when I was child, my mom and grandma both did lots of canning and freezing of fruits and vegetables. It was just the norm and at the time, I had no idea what a gift it was to grow up experiencing that art! And now that I have a home of my own, I enjoy carrying on the tradition. Although, I’ll be the first to admit that I do nowhere nearly as much of it as what they did! After home canned diced tomatoes, peaches are my favorite thing to can- partly because they are so easy to do, and partly because they taste 100 times better than store bought canned peaches! How do you can peaches? Let me show you! When selecting your peaches, choose a free stone/cling free variety. These are the best because they peel the easiest and it’s easier to remove the pit/stone. 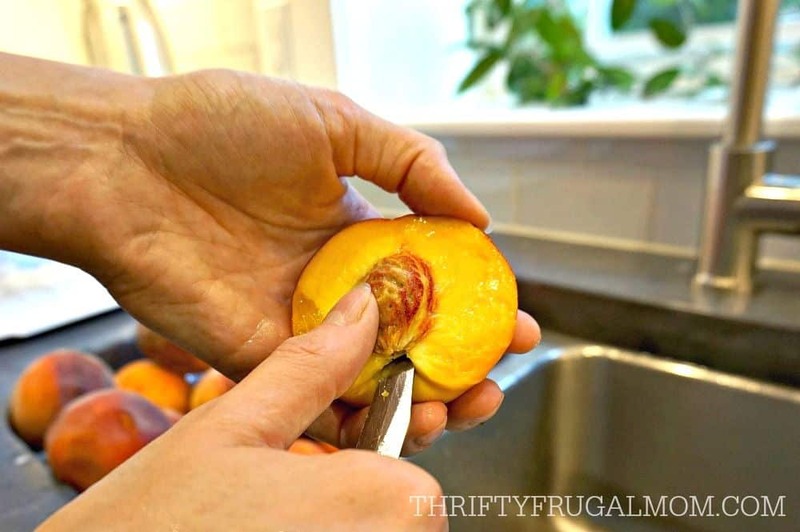 If you end up with a non-free stone variety, this little pitting spoon makes removing the peach pit super easy (although still harder than if your peach was a free stone variety!). If you buy or pick a large amount of peaches, it’s a good idea to lay them out in a single layer on newspaper or cardboard. This helps keep your fruit from squashing each other as they ripen. 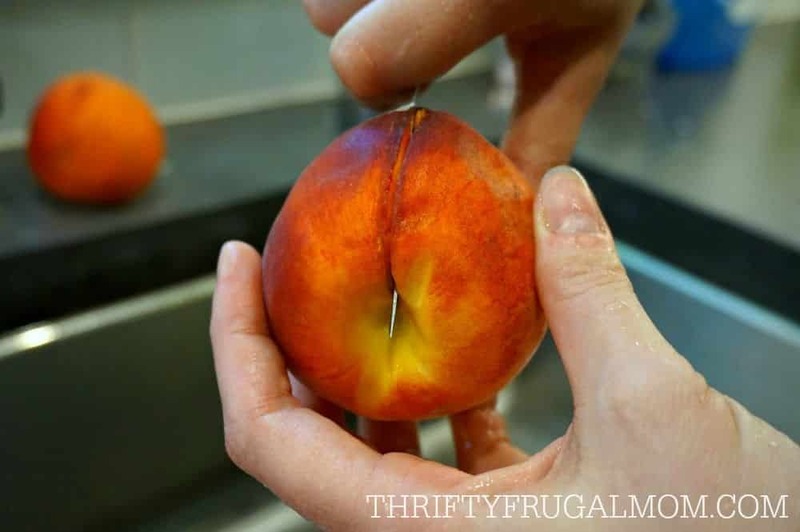 When you’re ready to can your peaches, select slightly soft peaches. Any that are still really firm are not quite ripe enough yet! Let them go for a day or two and check them again. Under running water, wash peach by gently rubbing to remove any peach fuzz and dirt. Take peach and slice in half, following the “seam” on the peach. Gently twist both pieces and pull apart. 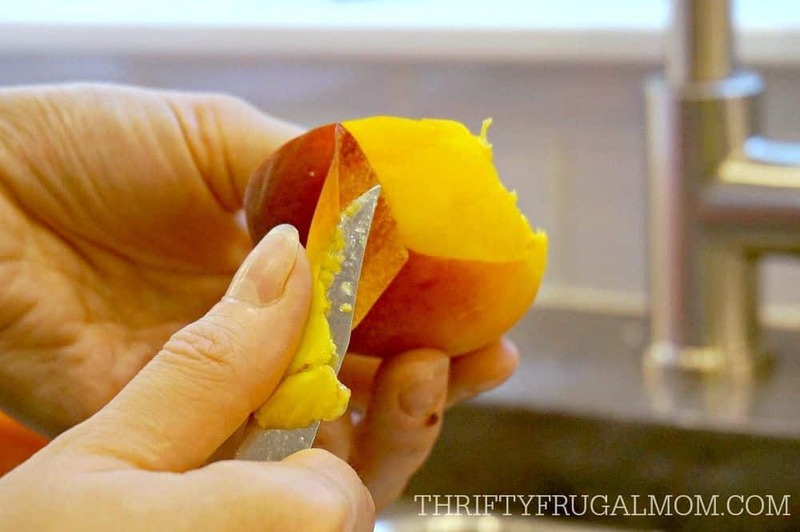 Remove the seed by putting the tip of your knife under the peach pit and pulling toward you. Peel peach. Some people like to dip their peaches in boiling water to help remove the peel, but I’ve found that if your peaches are nice and ripe, generally they are easy to peel without needing to do that. Just start at the top of the peach where the stem would be and carefully grab the skin with your knife. Pull gently and often you’ll get most of the skin in one try. The upside is that I feel like your peach stays fresher because it isn’t cooked at all by the boiling water. Cut your peaches into whatever size pieces you prefer. Traditionally, people canned peaches in halves. 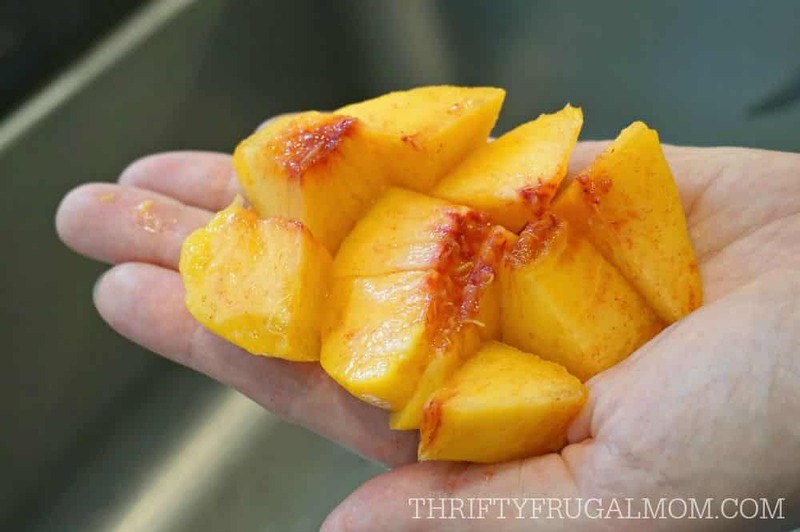 But I like to cut them into smaller bite sized pieces both because I can get more peaches in each jar (which saves me time and uses less canning jars!) and also because the bite sized pieces are easier to eat, especially for my children. 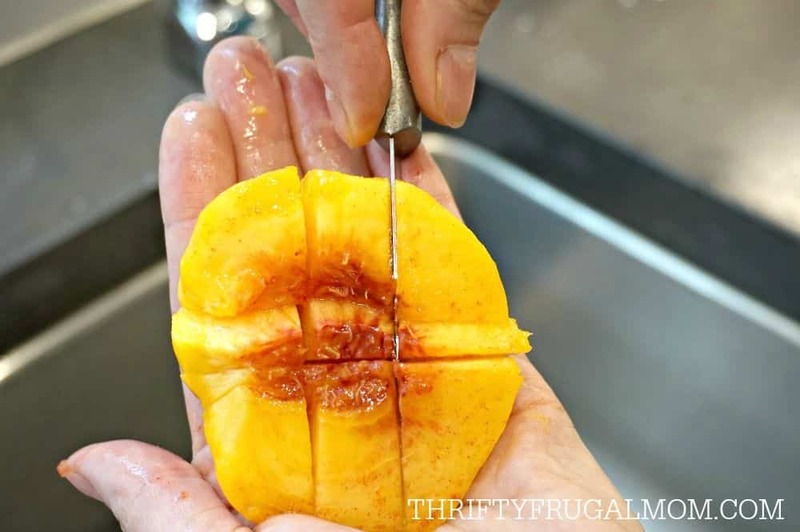 If you decide to dice your peaches, a fast way to do it is to cup half of a peach in the palm of your one hand, and with the other cut the peach first in half and then each of those to pieces in half again. This will leave you with 4 long pieces. Then just cut across those pieces to two or three times to create nice, bite sized pieces. 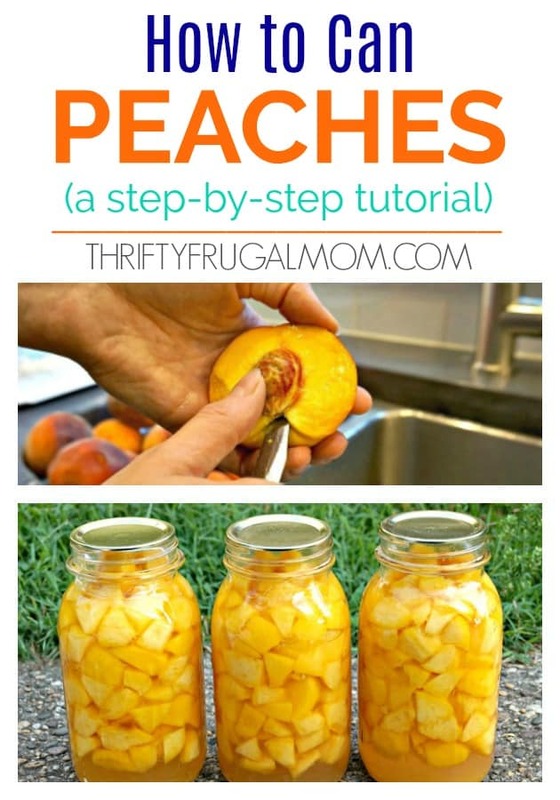 Place fresh peaches in jars. Be sure to check the opening of the jar for any nicks, cracks or rough edges, since any of these things may prevent your jar from sealing! 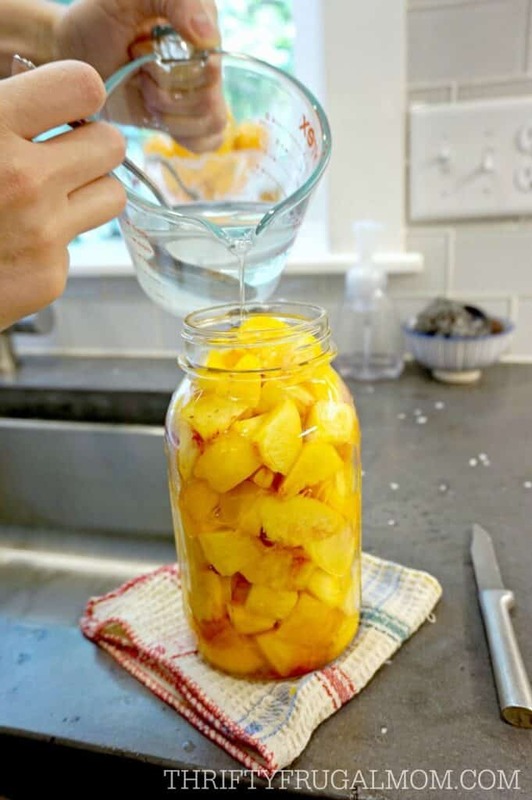 If you choose to can your peaches in halves or quarters, layer them in the jar with the cavity side down and overlap the peaches in whatever way you can to fill your jar as full as possible. 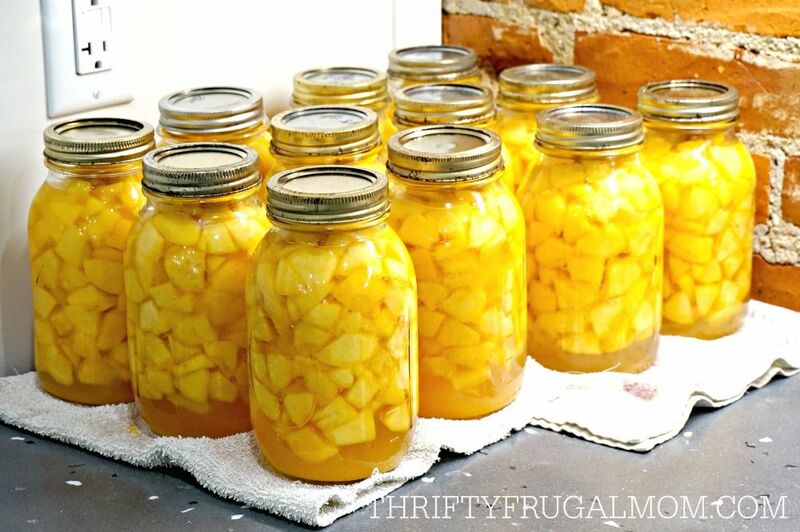 If you’ve diced your peaches, simply dump them into the jar. A funnel makes this super easy! 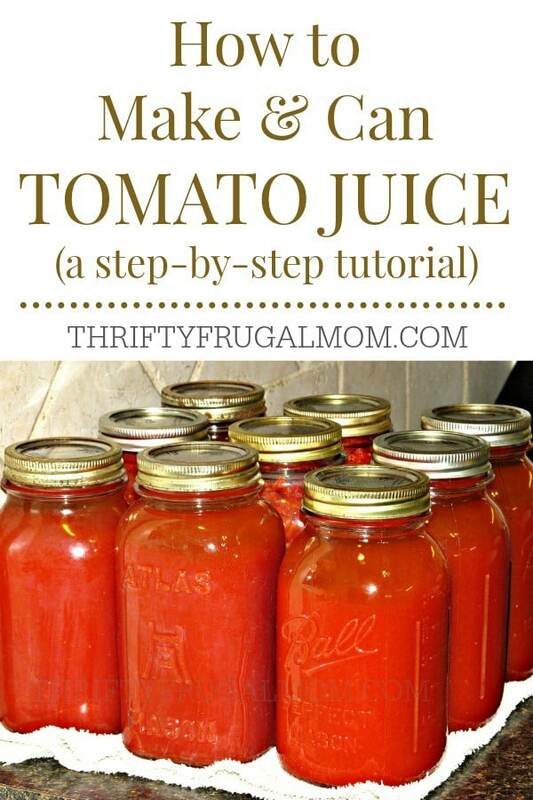 Once a canning jar is full, carefully shake it to settle the contents so that you can fill it completely. I often take a dish rag and put it underneath the jar and then gently pound the jar against the dish rag a bit. It always amazes me how much extra space this creates! 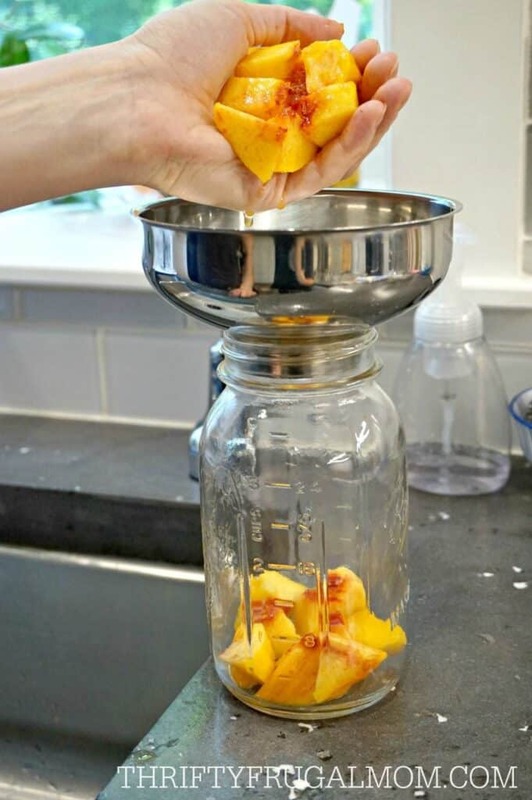 Add more peaches as needed to fill each jar to the base of the neck. To preserve the flavor and texture of the canned peaches, you need to cover them with a simple sugar syrup made by combining sugar and water. I prefer a medium syrup and the ratio for making that is 2:1, so 2 cups water to 1 cup sugar. Combine the sugar and water and stir until the sugar is completely dissolved. I like doing this in pitcher or measuring cup for easy pouring. Pour over peaches in jar and fill to the base of the threaded neck. 7. Can for 30 min. Place jars in canner. Fill with enough hot water to cover the jars. Turn the burner on medium high heat. 8. Remove from canner….let cool. Allow at least a little bit of air space around each jar, making sure not to have jars close enough to touch. Do not move until jars are completely cool. Jars should seal as they cool and you will typically hear a snap or pinging sound as the vacuum seal is formed. Lids will be slightly concaved when sealed. To test the seal, lightly tap the center of the completely cooled jar lid. If it is firm and does not move, it should be sealed. If it pushes in, it didn’t seal properly. You can still use unsealed jars, just put them in the refrigerator and use them as soon as possible. After jars are completely cool, you can remove the rings. Jars should be wiped clean before storing. Enjoy! You now know how to can peaches like a pro! A quick way to cut bite pieces is to lay an apple slicer across the top of the funnel. Press peach half through and bite sized pieces fall right in the jar! :) I just learned this last year and made things super quick! You make it look easy! I've always thought it would be cool to can my own stuff but I've been afraid to mess it up. :) It looks fun, though! Jaime, it really is easy. I promise. :) It's one of those things that kind of seems intimidating to do, but when you really do it, it's quite simple. And of course you have these handy tutorials to help make it super easy. ;) Give it a try! I just canned peaches the other week, and my five year old was delighted when I gave him a cutting board and then he laid the peaches cut side down and cut them the way you had shown. Went a pretty slow but he could start cutting while I was still peeling. That's awesome, Jo! Even if it was slower, you were teaching him a valuable skill and that's worth a lot! I had thought that I would try it with my 5 year old this year too, but our just turned 1 yr. old is super busy and was underfoot a lot and I was afraid that I wouldn't be able to supervise her well enough because of all his interruptions and investigating into what we were doing. :) Hopefully next year she can help more! I love this idea. I think I am going to give it a try. & maybe even look into making some jam! Thanks for the post. I just had to comment on your peach tutorial. I have one more easy step to add to yours. Instead of dicing the peaches on your hand, put them in cold water until your children have time to dice them for you. 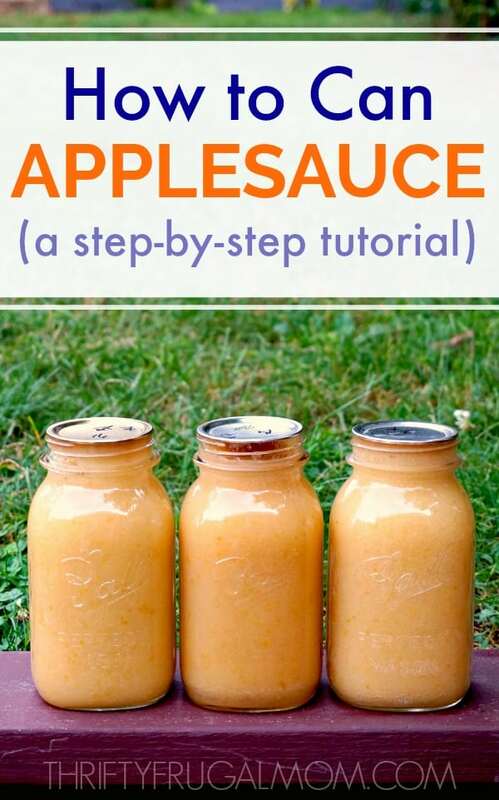 Get a gallon glass jar that is empty and put an apple slicer upside down on top of the mouth of the jar. Have your children push the peaches down through the apple slicer and it cuts them into the perfect bite-size pieces to can. You will have a few circle pieces from where the core is usually cut out but my children fight over those circle pieces! My children also fight over who gets to push of peaches to the apple slicer!! After they have a gallon jar full, we pour them into the quart jars to can. Enjoy! Thanks for that tip, Wendi! Such a great idea! I love the thing of using a gallon jar to make it easier for a child to do. And I can totally see our children fighting over the circles too! So funny how children get a kick out of little things like that. Can't wait to try this next year when I can my peaches! Yes, it sure can! If you are at normal altitude and are using a dial gauge pressure canner, it looks like you would can them for 10 minutes at 7 lbs. pressure. Hope that help! Hello, looks so amazing yet daunting for me to start. I'm from Indonesia, canning is not a common thing here. But still, I'm so interested to try it. I think it's a great idea and could save me from wasting foods. One question, is the seal reusable or only one time use? The equipment (jars, lids, rings, etc) is quite expensive here. Thank you in advance. I promise, canning really is easy! :) Follow tutorials like this one and you'll be just fine. The official word is that the canning lids are not to be reused, however my mom, grandma and myself have always reused them as long as the lid isn't bent at all, the rubber seal part looks totally in tact and the edge of the lid is not messed up at all. If the seal part looks at all like it isn't perfect or if the edge of the lid is even just slight turned up or nicked, the jar will not seal right. Obviously, as I said, the official word is that the lids are a one time use though, so if you choose to reuse them, for legal reasons I have to say that you do it at your own risk. Hope that helps! Sorry if this answer is somewhere in this post but I can't seem to find it.....how long do these peaches normally last? Is there a standard shelf life for them after they have been canned? Thanks! Leslie, canned peaches have a great shelf life. I've had them for up to 2 years, but often the quality does lessen a little after about a year. They are still edible but tend to get a little softer the "older" they get.